→Vortex Sparc AR Review – A Small Scope for the Practical Shooter! An AR scope needs to be simple, quick, accurate and easy to use. That’s precisely what the Sparc AR offers – an entirely straightforward design for those who love tactical shooting with the ease they desire. But apart from that, it is a light and compact design, very durable, reliable and practical as well. 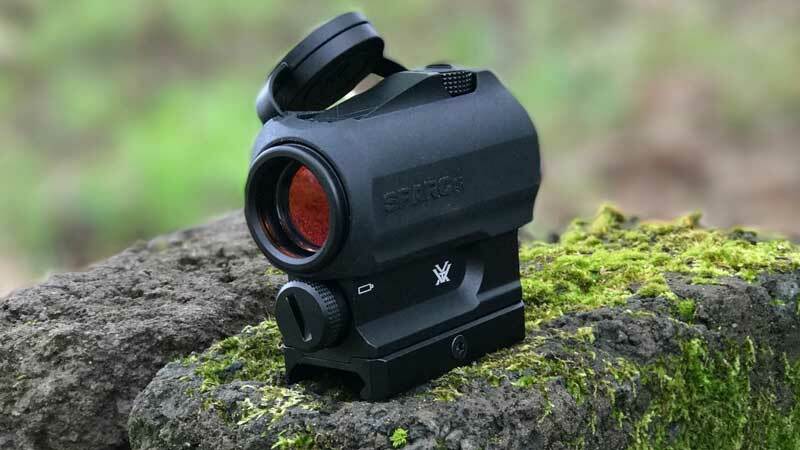 A scope for everyone who loves things well-done, the Vortex Sparc AR is there to deliver precisely what quick-shooting fanatics are looking for. So, is it a perfect riflescope for any AR gun? Here’s everything you should know about it before calling it anything! Come and see! A thing that makes the Vortex Sparc AR stand out from the crowd is the outstandingly small design that comes with great features. Yes, it doesn’t offer any magnification,and the red-dot reticle is one of the simplest in the market – yet its design is still outstandingly practical for its size and price. Besides, with its unlimited eye relief and overall construction, you can find the compact design genuinely convenient. If you are someone who loves quick-shooting and fast response in tactical activities, then this small scope design is easily an option you shouldn’t overlook. Even though it is small and thus less likely to fall or become uncomfortable when using it – the scope will also provide an impressive construction that will last for years and at the same time ensure excellent reliability unmatched by almost no contender in the same price/quality range. By using an AAA battery, you receive excellent red-dot availability for up to 300 hours at max brightness, and up to 6,000 if you use it in the lowest configuration. What’s more, the device will automatically shut off after 12 hours of not using, preventing battery waste. But what makes its construction top of the bunch is the shockproof anodized and aircraft-grade aluminum build on its body, plus the rubber armor that makes it even more resistant to harsh environments. It’s waterproof, fog-proof, and keeps all moisture, debris & dust out to damage your experience when shooting. As it comes in a short & small design, the lens of the Sparc AR changes almost nothing when it comes to color or image, but it certainly improves convenience slightly so you can get better vision wherever & whenever you use it. With the simple red-dot reticle you can shoot at whatever you want with top-notch precision without having to worry about vision or faulty aim. And when you add this to the image quality, you will merely get impressed at how clear& bright the lens is, mainly when you use it in daylight. The Sparc AR is nothing more than a riflescope designed for those who need a quick yet instrumental performance in tactical activities. And of course, it doesn’t fail to deliver exactly that. But what’s makes it capable of providing that quick and efficient performance is how broad its vision is. The lens and its overall design make it so straightforward that no matter how you use it, the broad vision & overall quality it offers will allow you to get at any range and shoot at whatever you want with ease, comfort, and convenience you never thought you could have. At a mid and short range, the Sparc AR has almost no competition when it comes to comfort. 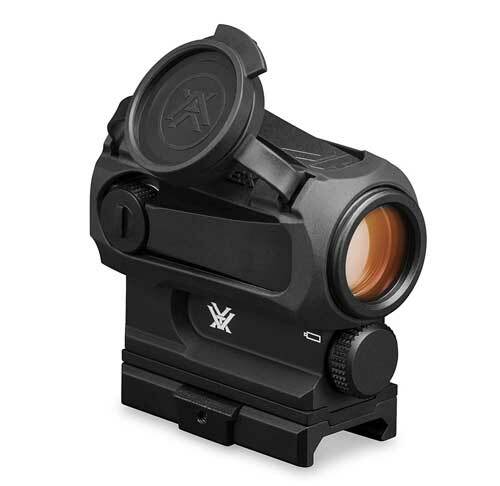 Its wide range of vision is practically unmatched, despite being not only small and compact, but capable of offering a wide array of adjustments from windage & elevation up to red-dot changes to fit any needs. At 7.5 ounces (0.4 lbs) it may feel like extremely light – but it is not. Actually, despite its small compact design and overall aluminum construction, the Sparc AR is seemingly a heavier-than-expected accessory. Users who were expecting quick and comfortable use were not surprised, as the accessory eventually became a little sturdier, harming the experience slightly. Especially for those who were into more active tactical performances and needed the lightest and most convenient build – the Sparc AR didn’t meet their expectations. However, those who used the scope for more calm and less weight-demanding activities obtained reasonably decent performances. So if you can cope with a suitable weight and not a perfect one – then the Sparc AR won’t become a problem for you. The red-dot diameter of the Sparc AR is of 2 MOA. It is seemingly perfect for the size and overall quality/price of the accessory. However, not every user thinks that about it. Some customers who could experience the quality of the device have only one thing in common to complain about – the red dot quality. It’s not bad, and it still does its job. But as some users said, it looks fuzzier than expected, especially during dynamic performances where dynamic movements and quick shooting are essential. This wouldn’t change its effectiveness and accuracy exponentially, but could eventually damage the experience and bug some users who are more demanding when it comes to clarity of the dot. Yet, it is nothing critical to consider,and that won’t make it the worst unless you are picky & demanding on this feature. Is the Vortex Sparc AR a Perfect Choice for Dynamic Shooting? It is not common to find a scope that delivers excellent size for both mid and short range shooting like the Sparc AR does. This makes it outstandingly effective for those dynamic tactical activities where being able to shoot accurately with the perfect precision is essential. It doesn’t have magnification, of course. It is not the most adjustable regarding vision features, and it won’t be reliable if you try to use it for long-range shooting. It is easily one of the best you will find if short or mid-range firing is what you need. Especially when you consider its price & quality range, the Sparc AR becomes a sufficient accessory to have. Not the best in terms of overall construction, but more than excellent when it comes to performance and convenience. Pick the Sparc AR if you want highly-dynamic shooting with ease. There’s no doubt about how successful it is at that!